Every TiVo user knows about the 30-second skip. Officially denied, yet easy to program into your TiVo, it allows you to skip TV commercials in 30-second increments. A typical half-hour block of TV time includes 22 minutes of programming with 6 minutes of national advertising and 2 minutes of local. Since TV stations prefer to join several spots together to make commercials whose duration is an increment of 30 seconds, you can conveniently bypass the entire commercial break by pressing the 30-second skip button a couple of times. TiVo also gives you to the option to record a First Run Only. Each episode of a popular TV show is broadcast several times. A given episode of The Daily Show with Jon Stewart, for example, runs on Comedy Central up to six times a week. With the First Run Only option, only the first airing of that episode will be recorded. This effectively allows the consumer to watch only the latest episode and to steer clear from re-runs. Advertisers don't particularly like either feature. As the average cost of producing a 30-second national TV commercial nears $350,000, courting a viewer who only records the latest episode and skips commercials is like pouring money down the drain. Largely the blame falls on the advertisers themselves. Although time-shifting technologies such as VCRs have been around for 25 years, the advertising industry hasn't developed adequate means to penetrate the shift and reach the viewer. Regrettably, they are resorting to brute force. Each channel or network is responsible for reporting episode details and their airing schedule to TiVo. TiVo organizes and distributes this guide data to consumers, who in turn record the programs they are interested in. In theory, that is. Missing or inadequate guide data is a hot topic on TiVo forums. Comedy Central is a known offender. When a channel fails to identify each airing of an episode in the guide data, the TiVo device no longer knows which episode is the first airing and which are re-runs. Consequently, TiVo errs on the side of caution, recording all the episodes rather than risk missing the first run. People have complained about faulty guide data but nothing has been done about it. The problem happens with The Daily Show all the time, which begs the question; is it accidental or intentional? Networks don't really care about accurate guide data. They know DVR users are probably skipping the commercials anyway. 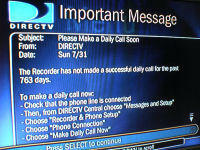 However, inadequate guide data works to the advertiser's advantage as it forces viewers to manually delete the re-runs. This involves watching part of the episode, most likely the beginning where commercials from the previous program overlap. Now, repeat that six times for each recorded Daily Show episode and you have effectively created a repeat impression of the first ad spot.